Zhejiang Kaishan Compressor Co; Ltd. Is Asia is largest and world is third largest air compressor manufacturer. It is also listed on ChiNext , with a market capitalization of RMB 17 billion as of September 2014, putting it 22nd among 225 listed companies in Zhhejian province. It ranks number one in ChiNext in terms of market capitalization .The Company has over RMB 6 billion in assets and owns land with an area of 1,200 mu. It also operates 4 manufacturing bases in Quzhou(Zhejiang), Lingang(Shanghai), Shuangqiao(Chongqing) and Shunde (Guangdong). Kaishan Compressor possesses powerful research capability. The Company has establishrd in keeping with its innovation model of “Developed in North America ,and made in China ”,a research center in North America where a group of world is top compressor experts has developed large number of high-technology products. At present the Company is staffed with three experts from the “Thousand-person Program ”, with over 150 engineers carryinng out research and development work at Kaishan General Machinery Research Institute. Kaishan possesses global leadership in the technological capability for screw air compressors .In 2013 the Chinese government published the “Catalogue of Energy-saving Products under Public Beneficiary Program ” for air compressors ,out of which 30.6% of energy-saying products were supplied by Kaishan Compressor . Furthermore each model in Kaishan Compressor is high-end series is Grade 1 energy-saving product, in particular its large-power screw air compressors with a power of above 160kw-very few products from among companies in the world are capable of achieving energy-efficiency of Grade 2and above ,but Kaishan Compressor is can save 12-25% of energy compared with those global companies . Ordinary screw compressors can regulate the motor is rotation speed through external inverters to regulate the air discharge volume in order that air volume produced matches that of used and hence achieves energy efficiency .However ordinary screw air compressors are built with motors with mains rated rotating speed, rated power and rated efficiency ,whereas external inverters would force the air compressor is motor to deviate from its mains rated rotating . Once the ordinary motor deviates from its mains rated rotating speed ,its efficiency will be reduced significantly ,and the greater the deviation the more significantly the efficiency will be declined.Withing all its rotating speed range ,the PM variable frequency screw air compressor is able to maintain extremely high motor efficiency , thus giving it superior energy-saving effect over ordinary screw air compressor with external inverter. In addition, the regulation range of external inverters for ordinary screw compressors is from 40% to 100%.In other words ,when the working condition deviates in excess of 60%,the external inverter will not be able to regulate the motor is rotating speed. 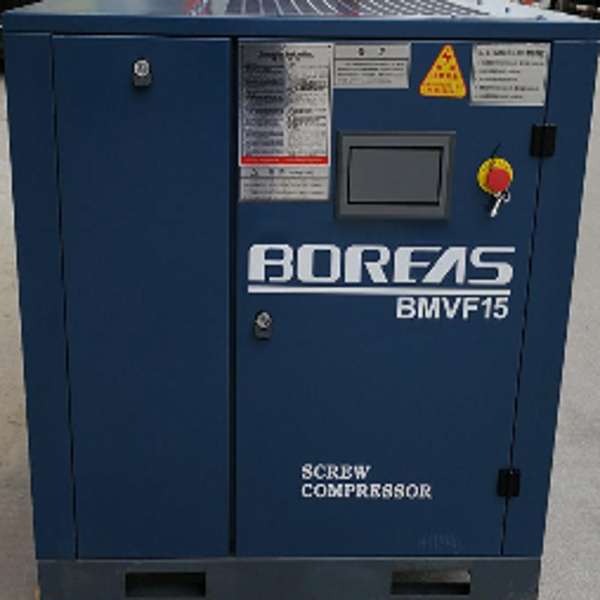 In contrast, BOREAS Compressor is PM variable frequency air compressor has a operating speed range of 15-100% ，which means that even in the case of 85% deviation from working conditions,BOREAS Compressor is PM varible frequency air compressor can still function effciently. The first is to have a highly efficient screw compression unit ; Secondly to have a high-efficient PM synchronous motor; Thirdly to have first-class PM variable control technology. BOREAS PM　variable　frequency　air compressor possesses significant technical advances in the following three areas.